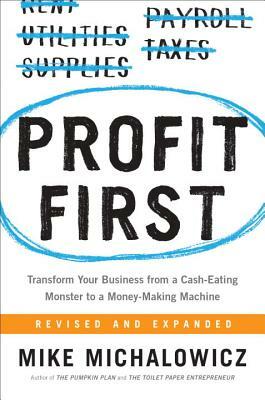 "Profit First is a game-changer. I implemented the system into both of my businesses and increased profits by 21%. If you want to turn a profit and grow your business, you need this book." "Profit First completely transformed how I handle business banking. I hadn't even finished the book before immediately putting a four-account distribution system in place for new income: operating expenses, owner expenses, taxes and profit. Mike's system moved me from break-even to profitable within a month. This book is a must-read for businesses large and small." "Why are so few businesses actually profitable for their owners? Profit First turns accepted wisdom on its head and shows the real reason business owners struggle with the bottom line. This book shows you how to take home more money almost immediately."